The sun sets behind the U.S. National Science Foundation-supported telescopes BICEP2 (in the foreground) and South Pole Telescope (in the background). For decades, theorists have speculated that in its earliest moments, our universe underwent a mind-bogglingly fast expansion that took it from the diminutive size of a proton to a vast expanse. Earlier this year, scientists announced a stunning development: what may be the first "smoking gun" evidence in support of that theory. Daniel Baumann, a lecturer in theoretical physics at Cambridge University whose research focuses on inflation and string theory. He has also held positions at the Institute for Advanced Study in Princeton and at Harvard University. Paul Steinhardt, the Albert Einstein Professor in Science and director of the Princeton Center for Theoretical Science at Princeton University. His research spans particle physics, astrophysics, condensed matter physics and cosmology, and he shared the 2002 P.A.M. Dirac Medal for his role as one of the architects of the inflationary model of the universe. Michael S. Turner, a theoretical cosmologist known for his work on inflationary cosmology, the characteristics of dark energy and the nature of dark matter. He is the Director of the Kavli Institute for Cosmological Physics as well as the Bruce V. and Diana M. Rauner Distinguished Service Professor at the University of Chicago. Below is an edited transcript of their discussion. The participants have also been provided the opportunity to amend or edit their remarks. THE KAVLI FOUNDATION: When this result was announced, there seemed to be two widespread reactions within the scientific community: First, excitement that the theory of cosmic inflation finally seemed proven, and second, surprise that not only had the BICEP2 collaboration found anything all, but that the signal was so strong. As theorists not involved in the BICEP2 announcement, were the three of you taken off guard? Did you expect proof of cosmic inflation to come so soon, if at all? MICHAEL S. TURNER: For me, it was pure shock and awe. There was no really good theoretical prediction before this detection. Highbrow theorists, who were looking for theories that satisfied some very strong theoretical principles, more or less said that we would never detect it. And the lowbrow theorists — and I put myself in this category — said, you know, we're pretty ignorant about physics at these scales and why don't we just look at a variety of models, some of them so simplistic that they couldn't possibly describe nature, but that might produce a detectable signal and guide our thinking. So to have the signal come in basically as big as it could be — bigger even — was just amazing. We're used to cosmology awing us, but this time it shocked us as well. DANIEL BAUMANN: Like Michael, my initial reaction was also shock and awe. I was intellectually prepared for these experiments, because of course I knew about them and I knew they had the sensitivity to see things, but somehow in my gut I wasn't prepared to have a signal that was as big as it actually was. At the beginning I was literally shocked. For two days I couldn't even comment on it because I didn't know what to say. PAUL STEINHARDT: My reaction was rather different, I think, than most theorists. I immediately set to reading the paper, and so my first reaction — and continued reaction — has been one of concern about whether or not these results are really correct. The observation is really important. My concern at the moment is that it's not yet clear whether or not they got it right. So others are now looking to confirm the results. If the BICEP result has to be retracted, these competing experiments will start the race again, to really nail whether or not these primordial gravitational waves are there. TKF: Paul, where does your concern come from? Are you worried that it's not necessarily what they think they've seen, or is it that there might be a flaw in the analysis? PAUL STEINHARDT: They've definitely seen something; they've detected this twisty pattern in the cosmic microwave background. But deciding whether it's due to gravitational waves produced in the early universe or due to some source in the foreground that's between us and where the microwave background was emitted, that's a key issue. There are lots of things in the foreground that could produce a similar twisty pattern. And many of those effects are larger than the gravitational wave effect they're trying to detect. So it's important that they understand those foregrounds very thoroughly. It's an exciting time in the sense that we now have instruments that can make this measurement. But whether the measurement has really been made, whether one can really claim victory at this point, is still uncertain in my view. This map of the sky is BICEP2's "smoking-gun" evidence. The distinctive twisting pattern, indicated here by black lines, was generated by gravitational waves interacting with matter and energy in the early universe. The pattern matches what would be expected if the universe underwent an enormous and almost instantaneous expansion. MICHAEL TURNER: I think they've done a really good job and many of the criticisms have been asked and answered. The big issue is dust, and another experiment, the Planck satellite, will have better dust maps. So far, it looks very good. I think they were pretty careful. But as we all know, an extraordinary result requires extraordinary proof. Maybe this will turn out to not be a real detection, but they've put a very good case forward. DANIEL BAUMANN: Over the past couple of months, I've become a skeptical optimist. I share some of Paul's concerns about whether we really have seen a signal that is cosmological. One of the tests to decide whether it really is cosmological is to see if the signal has the expected frequency dependence. Unfortunately, out of no fault of their own, the BICEP2 collaboration could only provide us with a detection at a single frequency, and a little bit of cross correlation with a second, very noisy frequency. In order to reject dust as an alternative explanation, we're waiting to see multiple frequencies and crosschecks with other experiments and in other parts of the sky. I'm still waiting for these other things to come in before deciding if this signal is actually of primordial origin and if its amplitude is as big as BICEP2 claims it to be. Paul Steinhardt is a theoretical cosmologist and the Albert Einstein Professor of Science and Director of the Princeton Center for Theoretical Science at Princeton University. PAUL STEINHARDT: One of the problems that we all have is that normally when a group presents results on the cosmic microwave background, they also present a so-called systematics paper that explains how they got the results that appear in their main conclusions. That paper has not yet been presented by the BICEP team. So it makes it very hard for anyone who's on the outside looking in to try to resolve some of the questions that are raised by the main paper. The Planck dust maps will be helpful, but even after that, we still need to understand exactly how they got to their conclusions. TKF: If we assume that all of the systematics are correct and that the BICEP2 results will be confirmed, what are the theoretical implications? Which inflationary models does the data seem to support? PAUL STEINHARDT: I would say that it depends upon what data you want to trust. It's not easy to put the BICEP2 results together with the earlier Planck and WMAP results and make everything fit — they don't line up all that well. If you try, you end up with rather strange and contorted models. These ugly models don't give you a lot of confidence in inflation at all. Other theorists are leaning toward simpler models, but that requires not taking all of the experimental results seriously. Depending on which results you ignore, you're driven toward different models. My own view is a little bit different still. One of the problems with inflation is that it really doesn't make predictions; it is so flexible that it is not falsifiable. You're always going to be able to change parameters and add degrees of freedom such that it can fit any combination of data no matter what is observed. This is a fundamental problem. A theory that is not falsifiable is not scientifically meaningful. PAUL STEINHARDT: I would say that it depends upon what data you want to trust. It's not easy to put the BICEP2 results together with the earlier Planck and WMAP results and make everything fit—they don't line up all that well. If you try, you end up with rather strange and contorted models. These ugly models don't give you a lot of confidence in inflation at all. Other theorists are leaning toward simpler models, but that requires not taking all of the experimental results seriously. Depending on which results you ignore, you're driven toward different models. MICHAEL TURNER: I think it's fair to say that nature is a still a lot smarter than we are on inflation. Our models are naïve, I agree with Paul on that point. But I wouldn't go quite as far as saying they're not predictive. We really haven't sharpened them up. This result could help us sharpen them up. I would also say that the level of proof in cosmology is a little bit complicated. To really prove things in cosmology, you need to close the circle. That means to do a laboratory experiment that tests things. It's going to be a long time before we close the circle on inflation. If you believe that there's some field of nature akin to the Higgs that caused inflation, then I think closing the circle would mean producing a related particle in the laboratory. That's a long way off. So I don't think the BICEP2 announcement proves inflation. But I think it has given us some hints on how to define our very simple ideas about inflation, on how to take them to the next level. TKF: Where do we go from here? If other experiments confirm the BICEP2 results but we can't do laboratory tests anytime in the foreseeable future, how do we proceed? PAUL STEINHARDT: There are eight different experiments that I know of that are chasing after these cosmic gravitational wave signals. If they find them, they're going to want to map them and measure other properties that will help us better understand the source of those gravitational waves and what kind of physics produced them—whether it's something like inflation or not. So I think the next few years are going to be a very exciting period. Daniel Baumann is a lecturer in theoretical physics at Cambridge University whose research focuses on inflation and string theory. DANIEL BAUMANN: Because the level of the signal seems to be so large, it gives us the opportunity to measure the signal very accurately and really prove that it has the shape that we expect it to have from inflation. Maybe we could even see some subtle deviations from that shape that would lead to the discovery of new physics. In that regard, we're very lucky that the signal is so big. TKF: One of the great quests in physics is to unite the fundamental forces (gravity, electromagnetism and the strong and weak nuclear forces). Does the strength of the signal—and the associated high energy scale in the early universe—mean we might have a chance to understand how the forces unite? DANIEL BAUMANN: Maybe. If BICEP2 is correct, then the inflationary energy scale sits not far below the Planck scale. In theories that unify quantum mechanics and gravity, we believe that there are additional scales between those energy scales. If the energy scale of inflation had been lower, it would be hard to see imprints of those kinds of effects. However, if inflation really happened at such a high energy scale, then these effects are around the corner and one might hope to be able to see subtle signatures of them. Theoretical cosmologist Michael Turner is the Director of the Kavli Institute for Cosmological Physics as well as the Bruce V. and Diana M. Rauner Distinguished Service Professor at the University of Chicago. MICHAEL TURNER: As Daniel says, this was very lucky, if indeed it is correct. With such a high energy level, we may be able to measure how the gravity waves change with frequency. That would provide kind of a consistency test on all of this. If we got extraordinarily lucky, maybe we would be able to directly detect these gravity waves. But it's going to take a while for us to get our heads around this. This was such a big leap; it's going to take us a while to catch up. PAUL STEINHARDT: One of the interesting things about the energy scale of the so-called theory of everything or string theory is that it's at the scale at which, when you go backward in time, you can no longer think of the universe as just having three space dimensions and one time dimension. Instead, string theory says that there are extra additional dimensions that are wrapped up and small, but which can no longer be thought of as small when you go back to this time scale. They would have a profound impact on the nature of gravity. It's interesting that it's rather difficult to fit together string theory and this very large energy scale. It's something that a lot of people have been thinking about and will become a sharper issue if it becomes clearer that BICEP2 really has made this detection and there really is this very large energy scale of inflation. DANIEL BAUMANN: I agree that there is a slight tension between interpreting the signal as a simple inflationary model and taking into account the additional fields and extra dimensions required by string theory. How is it that the data seems to be pointing to such a simple picture of inflation and the early universe, while our fundamental theories at face value look a bit more complicated? I am optimistic that we will understand this better in the future. PAUL STEINHARDT: Daniel, when you say it fits this very simple model of inflation, that's an example where you're changing something, either BICEP2's measurement or WMAP and Planck's measurements, in order to say that those fit a simple model. DANIEL BAUMANN: I might not be as concerned as other people about the tension between BICEP2 and Planck. That's because, even with my limited experience, I've seen these kinds of tensions appear in first detections and then disappear upon further scrutiny. For example, the early WMAP measurements had an anomalously large value for the optical depth of reionization that later went away. So although I can believe that there's a signal, I think that the details of that signal are still subject to change. PAUL STEINHARDT: I think that's fine as long as one makes clear that that's what one's doing. In other words, it's not true that those simple models fit the current data as presented. They fit the current data only assuming that you allow some significant flex in the reported results that have been presented by the combination of WMAP, Planck and BICEP2. That is, only if you assume the results of at least one of those experiments is significantly off. MICHAEL TURNER: Let me put a positive spin on what Paul is saying. We've been on a roll here since almost 1998, where every new measurement confirmed our very simple picture of the universe, called Lambda-CDM. Now we may be seeing what I like to call a crack in the cosmic egg; maybe everything doesn't quite fit together. It could be that when we put everything together two years from now, when we have a confirmation and Planck has reported more results, that we find out that the simplest possible model isn't working, and that there's something else that's needed. It could be that these tensions that Paul is talking about—although I would agree with Daniel that it's a little early to call them tensions—that they point to something else, some other exciting discovery that will help us move forward. TKF: A good number of inflationary models suggest that, once started, inflation should continue forever. This leads to the idea of the "multiverse"—that there are different regions of the universe that act differently. In some regions, inflation continues today and in others, like our own, it settled down to a relatively slow expansion. What do the BICEP2 results have to say about the validity of this multiverse theory? How does it fit into the simple models we've been discussing? PAUL STEINHARDT: The fact that the inflationary scenario leads to this multiverse is another reason why I have issues with it. We heard some people after the BICEP announcement say that this proves the multiverse . But the multiverse predicts a range of cosmological properties—in fact, literally every conceivable physically possible option will occur and will occur an infinite number of times in the multiverse. This is another sense in which the theory is totally unpredictive. Anything you might observe would be possible in a multiverse. To my mind, this makes the theory scientifically untestable and therefore meaningless. Once we accept one scientifically meaningless idea, I think we open the door to many other meaningless ideas and it quickly becomes a danger to normal science generally. I consider this to be a very serious issue for the entire scientific community. MICHAEL TURNER: In science, theories have to make testable predictions. On the other hand, I think science is a self-regulating process. We have to hold theories to the high, rigorous standards that scientists have been using since before the time of Galileo. But at the same time, you wouldn't want to throw out a really good idea just because it's immature and isn't yet testable. So I'm kind of in between here. The multiverse gives many of us a headache because it could be one of the most important ideas in the last 500 years, yet the way it's formulated, it's not quite science. I think that science will be able to deal with it. We're able to hold high standards and also allow ourselves to look at new, radical ideas. I put my faith in the younger generation, like Daniel. Paul, they're a lot smarter than we are and they're going to be able to figure this out. They'll keep us on track. TKF: Daniel, that puts a lot of pressure on you. DANIEL BAUMANN: That's true. But I agree with what both Paul and Michael said here. The way that I view inflation is that it's fulfilling two different types of roles. There's the conservative role, where we think of inflation as a mechanism to produce the initial seeds for the early universe, and we can make conditional predictions. Then there are also deeper questions about how inflation started, whether it is globally eternal, how we assign probabilities to the vast possibilities of the multiverse, and so on. Those are valid questions, I think, but they're not necessarily in conflict with the success of inflation as a mechanism for explaining the seeds of structure in the universe. TKF: Whatever is determined about the BICEP2 results, it seems like this is a very exciting time for this field. PAUL STEINHARDT: I certainly think so. I think we're absolutely at the edge of our seats. Even though we have different points of view about where we are at the moment, I think we all would agree that it's extremely exciting. And it's not like the situation is going to stay unresolved for a long period of time. There's this race going on with eight different groups going after the same science in different ways. The race is going to be intense, we're going to learn a lot, and the science will be clarified within a few years. That's going to be a historic moment that sets the agenda for what needs to be done next in cosmology and fundamental physics. MICHAEL TURNER: I completely agree with that. It is really exciting. We know a lot and we're learning even more, yet we understand less. We have to put the pieces together. I'm here in Paris right now with Planck collaborators. They just released some dust maps two days ago, maps that actually excised the BICEP field. So they're not saying anything yet. In fact, they have this thing called the BICEP face. Whenever you say "BICEP," they go to a poker face. So if I'm trying to be a fortune teller, I think they haven't disproven it. 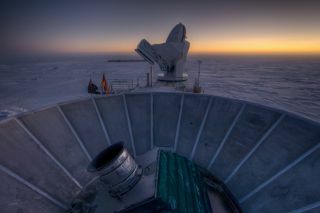 Planck has a shot at saying something one way or another; my colleague John Carlstrom at the South Pole Telescope has a shot at saying one thing or another; if you look at some of our other colleagues, all of a sudden people are excited about what's the next experiment to mount. Is it a satellite, is it another experiment from the Atacama Desert in South America, is it an experiment from Greenland, is it a balloon experiment? This is quite simply an extraordinary time to be around. We have a lot of puzzle pieces on the table and our hope is that we can put the puzzle together. DANIEL BAUMANN: As a member of the younger generation, this right now is the most exciting time that I've experienced. I narrowly missed the discovery of dark energy, so this is really the first time that I'm experiencing first-hand what might be one of the major discoveries in my lifetime. And as a theorist, it's been incredibly exciting. I've gotten very little sleep for about a month now as I've worked to understand both the data and the theoretical implications. It really did revitalize the field, in the sense that it brought everyone together to try to understand what the data mean, how we can interpret them, and what kind of theoretical models to build to understand them better.